In our previous two articles we looked at what B2B ecommerce is and how B2B eCommerce is different from B2C ecommerce. In this article we will continue exploring the world of B2B eCommerce by understanding the features critical for the success of a B2B eCommerce platform. A lot has been said about how B2B customers expect a shopping experience similar to what they have come to expect in a B2C environment. The features of a B2C eCommerce store are critical in achieving that but because of differences in how the two operate, B2B eCommerce store requires additional features which differentiate it from the world of B2C eCommerce. In one of our earlier articles “Key Features for a Successful B2B eCommerce Store” we have already covered a few features. While they will also be mentioned here we encourage our readers to read the previous article for better understanding. National Accounts – In B2B customers can create/ manage a primary account (parent account) with multiple child accounts. Each of these child accounts have different permissions (what they can access and order), credit limits (how much can they purchase), workflow (the approval process to confirm an order), etc. The B2B eCommerce store must allow you to do this. Further there are possibilities like pending invoices being consolidated for all these child accounts and settled against a single payment. Customer Groups – In B2B not all customers are same; what you offer them and at what price can vary a lot from customer to customer. 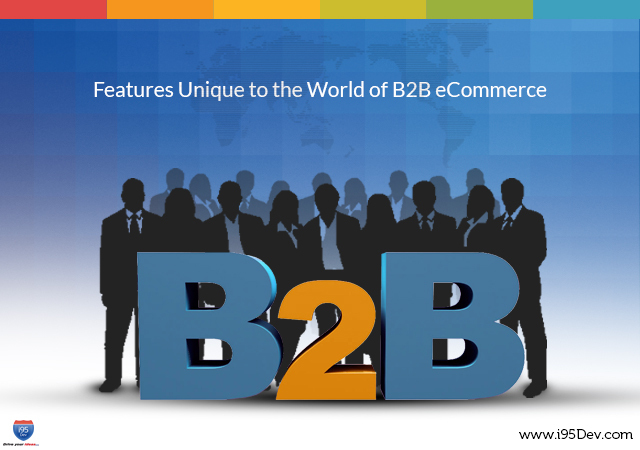 Hence a B2B eCommerce cart must allow businesses to classify customers into groups. Businesses can then set attributes like pricing, minimum order quantity, etc. specific to a group. Further, to comply with legal and regulatory restrictions, you can use Customer Groups to limit the products your customers can view and order. Advanced Search Functionality – Search is the most important and critical feature in both B2B and B2C environment. While a B2C business can survive with basic search functionality a B2B business requires more advanced features. Because B2B businesses often have increased number of SKUs and complex product attributes which can make it difficult for customers to find the exact product. Sales Literature – Owing to the nature of a B2B transaction, information driven with multi-level decision making, having detailed product information on a B2B eCommerce is critical for the success of the business. Customers, in B2B, often look for information like product features, technical specifications, product images, etc. Hence a B2B eCommerce store must not only allow businesses to display this information but also support various media types like pdf, videos, images, etc. Different Price Levels – The price of a product that a customer is charged in B2B is complex and depends on a number of parameters like customer group, order quantity, order history, payment terms, etc. Hence the B2B eCommerce store must make it convenient for business to define different price levels with these rules. Minimum Order Size – B2B business often benefit because of the scale of the transactions (large order sizes, etc.) which requires them mandate a minimum order size, during order placement, from their customers. Hence a B2B eCommerce cart must provide businesses the ability to set (at customer group or product level) and mandate (during order placement) the minimum order quantity. Configure Products – B2B customers might at times find themselves in a situation where they are required to configure the products in a specific way. To support this, the B2B eCommerce cart must provide customers a tool to configure products and, if possible, even update the price based on configurations selected. Quotation Process – Ability to create, modify and approve quotes online is a must in a B2B eCommerce cart for any B2B business to even consider adopting it. Order Approval Process – B2B orders often require approval before an order is confirmed and sent for fulfillment. While the orders are initiated by child accounts the approval comes from the parent account and hence requires an order process very different from that in a B2C environment. The B2B eCommerce cart must support this order approval process to incorporate the existing workflows in their B2B businesses. Credit Limits, Payment Terms, Bill Pay – Sales in B2B usually happens on credits which are then settled based on agreed payment terms. Sales in B2B eCommerce are no different and require the eCommerce cart to support the same functionality. Credit limits and payment terms can either vary or remain same across the child accounts and pending invoices (across accounts) can be settled either through a single payment or multiple payments; and a B2B eCommerce store is expected to support all this functionality. ERP Integration – While not mandatory, a seamless eCommerce and ERP integration can do wonders for the B2B businesses. The integration will not only automate and streamline order fulfillment but also improves customer experience by making the right information available across systems. There are other benefits of integration and for more details read our article Reasons for Microsoft Dynamics ERP and eCommerce Integration. Sales Person – In B2B customers often require support, pre or post purchase, from your sales representatives. To support these requests, your sales representatives might need access to information to address customer queries, or add customers, create or update orders for customers, check order status, etc. To provide your sales representatives the required support your B2B eCommerce cart must provide them with a Sales Portal like functionality. Simplify Order Placement – B2B customers are often aware of what they want (products they want to order, or repeat previous order, or reorder a previously ordered item, or order from a saved cart or list, etc.) and hence require functionality to simplify this process. B2B eCommerce cart must not only allow customers to save carts or list to use in future for order placement but also make it convenient for them to repeat one of their earlier orders. Support Multiple Warehouses – B2B businesses might fulfill orders from not one but multiple warehouses and hence the eCommerce cart must be extensible to support fulfillment from multiple warehouses. This, by no means is an exhaustive list and there are other features (industry specific, company specific, etc.) which are critical for the success of the B2B eCommerce store.